ONLY: £12.99 + £2.99 DELIVERY! Buy Your Special Edition and Get a Digital Marketing Resource Kit! The information I had previously shared around the social networks had changed. The tools I had shared were either no longer in business, or had been outperformed by competitors. I knew that because the online world had evolved, that I also wanted to completely re-write the book, and bring it as up-to-date as possible. 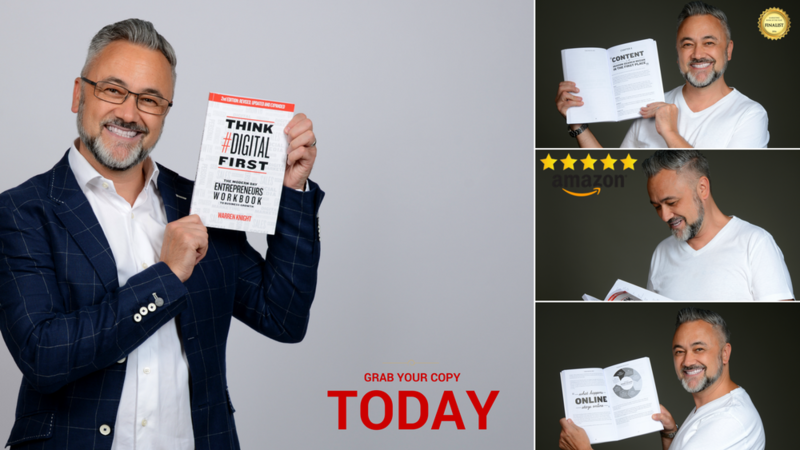 Think #Digital First Second Edition is a workbook designed for creative entrepreneurs, business owners and sales and marketing managers that shares with them the importance of having the right mindset to focus on technology, sales, and marketing. I have analysed exactly what my audience wants from me, and I have taken what was a readable book and turned it into a workbook. The way you learn has evolved, and I knew that I needed to do something different and unique. The second edition of Think #Digital First is a unique combination of how-to’s and real-time worksheet implementation. “Marketing is not a standalone activity and this book takes business owners very effectively through all of the aspects of a company that need to be considered to build a great marketing strategy. Warren reminds us that for marketing to be effective, the business must be in a good shape first. Far more than just theory, he provides practical step-by-step actions and tools to implement. It is a great guide for any business owner”. Must Read - brilliant new socially savvy business and social media guidebook for entrepreneurs; start-ups and business owners. The very readable, energetic and powerful book is well-structured and each chapter builds your understanding and knowledge, enabling you to implement the strategies he recommends to build your business, your customers and your followers. Warren provides a step-by-step process to improve your business mind set and build your framework for success. He shares the latest tools and technology; well-illustrated with excellent graphics, lists and dot points that are easy to follow. My recommendation is to put your order for a copy of the book in now on his website before you miss out! "Warren Knight has shared not only his extensive research - and what a resource that is - but his personal experience in this latest book on digital marketing. He holds nothing back in his bid to offer help to both the new and growing entrepreneur." "Most businesses invest a lot of time and money in a marketing strategy but without the strategy, and then wonder why the results are poor. Warren has had much success helping ambitious companies fill that void, and he has laid it all down within his excellent book for the modern entrepreneur." Having known Warren for 20 years I can say he is a true entrepreneur. Warren has definitely found his home in the digital sector. Identifying opportunities and taking on challenges he is adaptable and sharp minded. Warren has shown that he is adept at integrating and most importantly creating value for his clients.I highly recommend that you invest in his book; Think #Digital First on your journey to greater success in the digital sphere and your life. Making the most of a digital opportunity is being aware of the available tools, a commitment to keeping up to date with what’s new and coming online, and an openness to seek advice from digital experts. One of those experts is Warren Knight and in this helpful book he sets out the key things you need to know to think digital and grow your business. His knowledge is based on years of experience of supporting entrepreneurs. It’s a must read book to help you on your digital way! Think #Digital First is my #NBF!! As usual, Warren has delivered above and beyond and given those of us who run a SME an essential, easy to understand 'work-book' packed full of cutting edge digital information, that when implemented 'consistently' will help your business soar online. This is the only book you'll need in 2015 to help you grow your business online. Thank you Warren for making this digital journey way more easy to navigate for us NON-technical people!! Love it! #Buyitnow!! From start to finish “Think Digital First” grounded my ideals on business life in the digital age. This book allowed me to reposition my thought process, think outside of my current box, and strip everything back to basics, whilst also allowing me to strategically work to my brand strengths. Warren provides a wealth of personal experiences as a process to attack your digital environment head on. As a modern entrepreneur be inspired to Think #Digital first! Enter in your details to Order Warren’s Book.